I know you know what I am going to say. Vertical Blinds, there I said it. First let me tell you that they are not designed the way they used to be with chains, weights, yellowing plastic grovers and complicated headrails. You can now expect to see beautiful fabric like embossing on PVC vanes with a much sleeker headrail and various options for the matching valance. Some of the PVC vanes are translucent, while some offer a “S” curved vane. If you prefer the fabric vane the weights are sewn into the fabric and are not all chained together. The pros to covering your slider with verticals is they have a nice sleek stack back, you can open them to any distance you like, vanes rotate to allow control of light and privacy, fabrics are easy to keep clean and they are by far the most reasonably priced of all the options. Some of the cons are you must open the verticals to use the door, if you aren’t careful you can snap a PVC vane at the stem and they could make noise when the breezes blow if the door is open and you are requiring privacy. 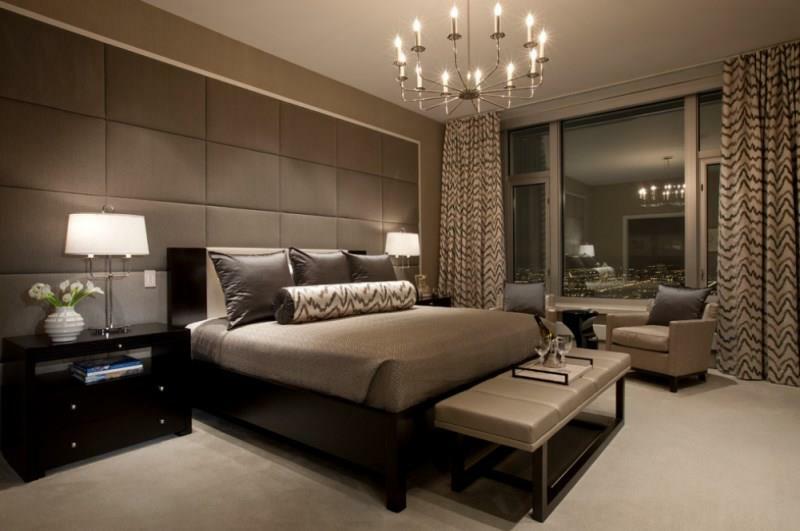 When choosing to decorate with drapery panels you can really let the rooms personality come to life. There are so many choices of fabrics, then add to that embellishments and/or banding and the possibilities become endless. Here is where a good designer would be a wise investment. The easiest rod option would be to choose a traversing rod, they require little maintenance and will not require you to handle the fabric, thus keeping fabric cleaner longer. Rods are designed as single or double allowing you to install a sheer or more translucent fabric underneath a heavier more decorative fabric. Then there is the choice of which style rod, again the possibilities are vast. Draperies also have different headings from which to choose. Three finger pinch pleat, goblet pleat, bohemian pleat, inverted pleat, ripplefold, ringed, grommet or tab tops. One should also pay careful attention to drapery fullness. The ideal is 2.5:1 fullness. Another decision to be made is will the drapery to be lined and/or interlined? Some of the Pros of drapery panels would be the vast opportunity for design, the degree of privacy is easily controlled, draperies can offer ultraviolet protections, sound absorption, winter/summer energy efficiency. The cons would be that drapery panels can be heavy and depending on the heading chosen will have a greater stack back, the amount of drapery at the side of the slider when panels are in the open position. The price of custom draperies is broad and you will need to consider cleaning and damage caused by the sun on the south and southwest sides of your house. 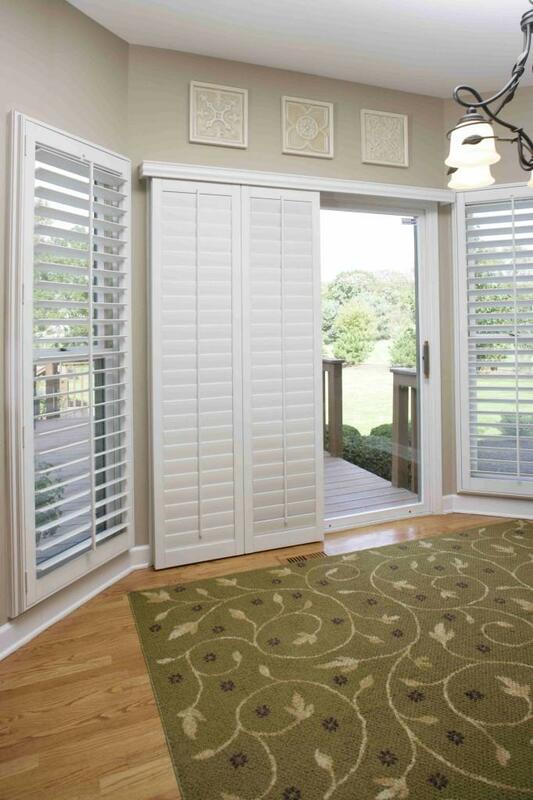 Plantation shutters are a beautiful and practical way to dress a sliding door. They provide timeless beauty and durability. The most oft used design is the Bi-Pass or Bi-Fold configuration. 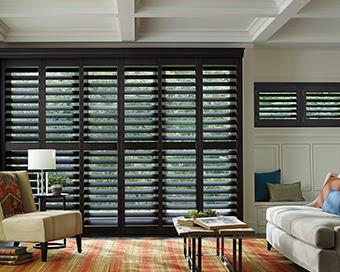 Hunter Douglas offers a gorgeous dovetail construction wood shutter in various louver sizes 2 1/2”, 3 1/2” and 4 1/2” . 36 standard colors and two tilt options front tilt or rear tilt. The benefit of shutters are the high ultraviolet rating, the summer/winter energy efficiency, the furniture beauty, ease of cleaning and the ease of privacy control. A draw back would be the stack on a By-Pass configuration and the projection on the Bi-Fold configuration. Also, shutters can be quite costly. You would consider this as an investment that will not grow old or dated. 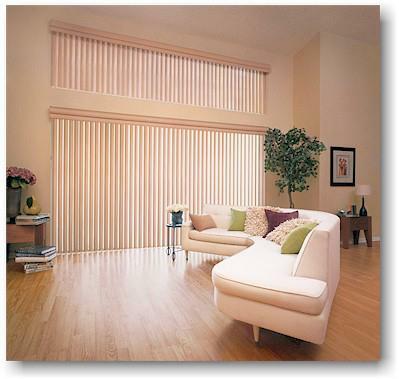 Sliding doors can be treated with shades as one or as individual panels. Hunter Douglas offers a beautiful product called Luminette it is a vane with a sheer panel that operates like a vertical blind. Vanes can be light dimming or light filtering. To see it is too love its beauty, function and design. 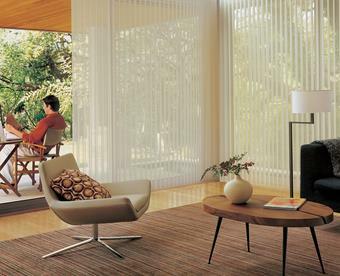 Another option in the shade category from Hunter Douglas would be Vertiglide from the Applause or Duette collection. 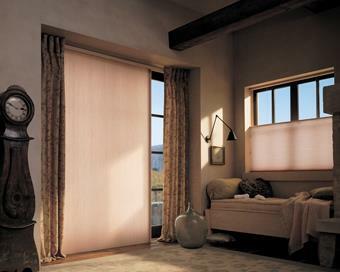 This is a vertical cellular shade that has a slim 6” stack back regardless of the width. The color options are broad, the energy efficiency is outstanding as are the ultra violet protection and sound absorption properties. These options can be dressed up with decorative stationary side panels, upholstered cornice board or board mounted valances.